VERTIGO: ARE YOU SICK OF FEELING DIZZY? Episodes of vertigo can range from mildly uncomfortable, to utterly overwhelming. But it should not be simply tolerated or ignored, as there is often a medical explanation for this symptom, which can be diagnosed and treated. At London Doctors Clinic, our experienced GP’s are capable of investigating and helping manage patients with symptoms of vertigo, or providing specialist referrals where necessary. I Feel Dizzy: Do I Have Vertigo? Vertigo, unlike most people think, is the symptom of feeling like the world is spinning around while you are still. It can happen sitting or even lying down and is not related to how high above the ground you are. 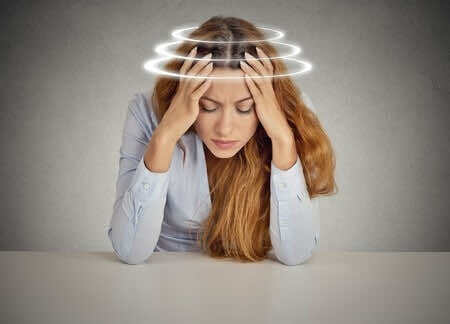 It can be difficult to distinguish vertigo from dizziness, falling and fainting as they can all make you feel unstable. If you think you may be having vertigo try to think about how it feels and what you can see when you are having the episode. If you feel as though you are unbalanced and as though the world is spinning, like having just got off a roundabout as a child, this is likely to be vertigo. Vertigo is often made worse with any movement. Feeling lightheaded or faint is less likely to be vertigo but is just as important to investigate at the GP. Inside your ear are three “semicircular canals”, these contain fluid and are lined with little hair like cilia. These are moved when the fluid moves, for example when you turn your head, and between the six semicircular canals your brain works out which way you are moving, based on the information from the change in direction of the little hairs. Clever, hey! This type of vertigo is can be caused by a disturbance in this semicircular canal system. There is usually some small pieces of debris in the fluid in the middle ear, hitting the semicircular canals. This can cause the little hairs to transmit wrong information to the brain regarding movement. The inner ear is responsible for balance, and telling the brain what is ‘upright’, hence why symptoms of BPPV are worse when moving your heard with respect to gravity, and you may find it very difficult to stand, walk or even turn over in bed with benign paroxysmal vertigo. Sitting or lying still may offer you some relief, but your doctor will be able to diagnose the vertigo and arrange for you to have an Epley manoeuvre. An Epley manoeuvre is performed by a specialist to clear the debris from the the canal through a series of head movements. It may be uncomfortable at the time because of the head movements, but it has no other side effects and the results should be felt straight away. If the Epley manoeuvre doesn’t work the first time your doctor may want to try it again, probably on a separate occasion. Another cause of vertigo from these semicircular canals is changes in the amount of the fluid in the semicircular canals. This is called Meniere’s disease if there is no other associated condition or trauma. Menieres disease is more likely to occur as sudden and recurrent vertigo lasting from minutes to hours. You might vomit or fall over during the attack. You may have vertigo several times a week or have periods of years without any vertigo. This can make Meniere’s disease difficult to understand and cope with but your GP can offer advice and support. During an attack of vertigo associated with Meniere’s disease, it’s important to remember that your attack will end, and it’s best to stay still and safe, in bed, until then. If you are having severe or prolonged attacks your doctor may give you some anti-sickness medication, this will make you feel better, but unfortunately will not cure the condition. Vertigo can be caused by acute labyrinthitis, an acute inflammation in the inner ear that may also affect your hearing. This is most often caused by a viral infection and the severe vertigo should only last a couple of days with full recovery within a couple of weeks. You may feel unwell from the virus as well as the vertigo and your doctor will be able to give you advice for both. Of course, these serious causes of vertigo are very rare, but important to rule out. So if you’re experiencing symptoms of vertigo, dizziness, or feeling lightheaded, don’t just ignore these uncomfortable symptoms – book a GP appointment today at any London clinic of our 12 locations, including our newest Fleet Street clinic, to get the diagnosis and treatment you need. Should your symptoms persist beyond the expertise of our GP’s, we’ll happily provide a private specialist referral to an ENT Consultant, where appropriate.